Voted One Of The Best Japanese Restaurants In Myrtle Beach 2 years in a row. High quality Japanese. Mostly lite fare. Family owned. Hana Teppanyaki offers authentic Japanese entrees in an elegant sit-down Japanese environment. Everything about Hana Tappanyaki House is above the average Japanese restaurant. The food is fresh and prepared just the way you ordered it and expected it to taste. The owner is very involved in customer service and not one that "hides" and the partner is the one that prepares your meal. All is excellent. The wait staff is just very engaging when need to be and not when you just want to be left and eat, especially Valerie, she's very attentive and friendly and cares about you the customer . We tried to get into the Japanese restaurant at Broadway at the Beach on two different nights. Each time there was an insane wait. We googled Japanese restaurants and happened upon this one. It was a little off the beaten track so we were not sure what to expect. This restaurant did not disappoint! The food was delicious and very fresh! The service was great too! I would recommend this to anyone looking for delicious Japanese food at a reasonable price. We have gone to the restaurant many times and have always been pleased. The service is great and the owners wife is always a gracious host. Will return most definately!. Love, love, love this restaurant! The food is ALWAYS fresh and delicious! Have been there at least a dozen times and was never disappointed! Whenever my husband and I have out of town guests, we always take them to Hana Tappanyaki. Always looking for excuses to go back and the owners are very friendly! All positive reviews here were right; party of 6 seated right away, great service and food. Very affordable too. It is a little off the bitten path, but worth the trip. Terrific food in a more relaxed atmosphere than the table side hibachi style restaurant. The food is absolutely delectable, the service is great, and the atmosphere is very warm and inviting. A definite hidden gem in Myrtle Beach that everyone should visit at least once. Although, it's hard to go only one time once you have discovered the delicious food that Stanley cooks on the hotplate grill! After reading the "rave" reviews decided to try..........well very disappointed. There were four adults in our party, and two other tables being served, one table finishing, one table being served, a Friday evening 7:30, restaurant was not busy. Waited for server to ask if we were ready to order, when he didn't, called him over to the table to take our order.Had to remind the server to bring our appetizer (saw it on the counter as I was coming back from the rest room). Keep in mind, there were only three tables, not packed. Very nice young man, just hope he is not pursuing a career as a waiter. The house soup was good, and the Miso soup was OK, tofu was cut into tiny, tiny little pieces/cubes. One dinner that was served was not what was ordered, waiter's explanation was "there are similar entrées on the menu, wrote the wrong one down." Whatever.........the noodles (angel hair spaghetti with soy and too much ginger) were not eaten, the fried rice was pretty good, however. Portions were small on the veggies, too many onions, table felt they were cut into to small of pieces. Overall, the food was what you would expect in a mall food court, should have been leery that it was in a strip mall (reviews were good), too pricey for the quality of food, almost 100.00, do not mind spending the money but expect better service and quality of food. I think for lunch/lunch specials would be fine, but not for dinner with friends, there are so many good restaurants in MB area for that. We won't be back. Hana Tappanyaki House, has excellent food, service and price. My girlfriend and I frequent it for lunch on our lunch hour from work quite often. Everyone greets us and remembers what our favorites are. We no longer go to those "fast food" Japanese restaurants when we can have a first class meal quick. The food is not prepared before hand and sitting around, it is made fresh everytime. If the locals love it you will too!! Absolutely wonderful. We called ahead for a group of 11, and they reserved us a table with no problems. One of us has to stay gluten-free, and they took care of that with no problem. The food was amazing. Excellent. Not to mention, the level of service was top-notch. The staff was amazing, such nice people. It's a shame that more people don't come by here. You will love this place! When it comes to Japanese food you can go for fast and cheap, expensive and mid-range quality, or you can just eat at Hana Teppanyaki and get a very high quality, reasonably-priced meal. I've been going once a week for the past several months and it's very easy to tell that everything in the restaurant is done the right way - extremely clean, great service, gracious owners, quality food, affordable prices, generous portions. Even the mints they hand out at the end of the meal are delicious! Highlights of the menu? Filet and Scallop dinner, Salmon, Calamari appetizer, House soup (wow), mouth-watering dipping sauces (yes, they have mayo), chocolate cake and friend twinkies for dessert. They also run lunch and early-bird specials everyday. Really no reason not to eat there regularly. That's why I do! Well so far i have nothing but 5 STARS for Hana Tappanyaki House! I am new to the area and live at Seraside Grove Apartments right down the street. I called hoping they delivered and they do! then when i asked about a website to see the menu they said it is still work in progress but the guy who answered who is also delivery guy said he had a few extra minutes and began reading me the menu and giving me prices and answering questions. Which was SUPER helpful! then i said it all sounds good but it is kinda hard without me seeing the menu to decide. he said hold on, grabbed a manager and they e-mailed me the menu!!!!! AWESOME!!!! i placed an order a few minutes later. if the food is even half as good as the service they will have a customer for life! by the way it is a Friday night that he took time to go over menu with me. You just don't find service like that anymore. My friend and I ate here a week ago on Sunday night! This is one the best kept secrets of the Carolina Forest area! Everything was perfect and the food was awesome. What a delight we found them on a search! Try this restaurant! You will be very happy you did! The filet and jumbo shrimp was made perfectly. Many cannot cook my steak the way I like it, but Hana's cooks it perfectly every time. I love the atmosphere and friendly staff and will continue to choose Hana's to satisfy my Japense food cravings! Best hibachi I had, price is affordable and quality of food are excellent. I have been eaten many Japanese restaurant. Hana is the best in town. We visit Myrtle Beach very year for family vacation. I Google Japanese restaurant and found this restaurant, it was best hibachi we had. Scallops were juicy and filet was melt in your mouth and cooked just right. Compare to a lot big Japanese restaurant; their price and quality were better. We plain to visit again next time when we are in town. Hidden jewel of Myrtle Beach. We had a fantastic meal as always at Hana Teppanyaki. The food portions were great as well as the food quality. What I love about this place is that it consistently great all the time. I have been eating here since it opened last year. I highly recommend you go check it out! The service, atomosphere and cleanilness of this restaurant compliments the whole dining experience. I have been to this restaurant a few times and consider it one of the best for food quality around Myrtle Beach. If you haven't been there it's time to try what real Japanese food is suppose to taste in an atmosphere off the tourist attraction trail. This restaurant would definately be overwhelmed by customers if it where on the main drag of tourist alley. Delicious to say the least and I hope the owners hang in there and make it through this dismal economy. 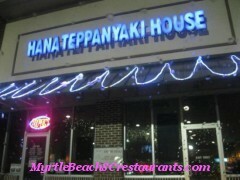 Best Japanese restaurant in Myrtle Beach! Friendly staff, nice atmosphere, great food, excellent location and price! I will go back again! This Japanese restaurant is my favorite. We just moved to the myrtle beach area and its near our house, so we thought we would give it a shot! It was excellent. The Salmon is out of this world, so fresh and tasty! The veggies were great, overall experience was fantastic!! Great Restaurant!! Food is always awesome! Soft shell crab is to die for! Scallops exceptional. Micky's soup is over the top. Never have been disappointed. We take everyone that comes to visit. It's a true find. Great food! Always excellent customer service! And they now have delivery!! Love this restaurant! Hana Tappanyaki has excellent food which is very tasty and healthy. The restaurant is quiet and quaint. Service is friendly, fast, and consistent. Hana is good if you need a quick lunch or a nice relaxing dinner. By far my favorite Japanese restaurant in the area. I come here on a weekly basis for the food, service and atmosphere are all outstanding. Top quality at affordable prices. The owner Micki is a true gem and will make you feel at home. If you want to treat yourself then experience this restaurant. 100% guaranteed. ENJOY!!! I know I do every week. Excellent service! Great food! Best scallops ever! Excellent all around experience. The food and service is A+++. Great value for your dollar.